Beatrice Florence Claybourn (known as “Bea”) was born on 4 March 1885, in Woodlawn, Illinois. She married (1st) on 2 October 1904 to Frank Elza (or “Elzie”) Williamson. [Frank Williamson was born on 18 June 1873 to George and Mrs. Williamson in Illinois. He later married Laura Belle Ashurst and died on 1 March 1947.] During the marriage she lived in Mt. Vernon and Springfield, Illinois. Eventually Bea, her husband, and their five children packed up all of their belongings in a Model T Ford and drove from Springfield to Southern California, camping along the way. Bea’s daughter Juanita later recalled, “Sometimes we would be lucky and make 100 miles a day. At night we would set up a big canvas tent and cookstove. We kids – the oldest was 14, I was nine – thought it was great fun, but I’m not sure my parents did. When we got to California, relatives who had moved there before us would take one of us in. We were parceled out for a time; sometimes we would live in a tent.” It was a few years before Frank could build them a home. Eventually Bea and Frank divorced and she married (2nd) Earl Ambrose Ryan on 24 November 1928 in Alameda, California. [Earl Ryan hailed from Huron, South Dakota and was born on 27 March 1894.] They had no children together, but Bea had six children from her first marriage. According to Bea’s ancestors, “Earl loved all of [Bea’s] children as his own and they all worshipped and loved him back.” Bea and Earl made their home at 2000 Ahlin Drive in Montrose, California. Bea passed away on 25 November 1974 in Los Angeles, California, the very month she and Earl would have celebrated their 46th wedding anniversary. Earl passed away some years later on 12 May 1983. Bea and Earl are buried together in Forest Lawn Memorial Park Glendale Cemetery in Los Angeles County. Bea’s first husband Frank is buried in Roselawn Memorial Park Cemetery in Sangamon County, Illinois. Elnora Frances Williamson (“Nora”) was born on 17 May 1906 in Springfield, Illinois. 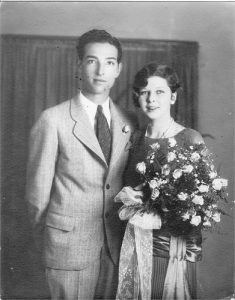 She married (1st) Harold Whispell on 29 July 1924, but the two later divorced. She married (2nd) after the 1930 census to Marshall Stanley Braun (born 6 June 1905 in Washington). Nora never had children. Marshall died on 31 August 1991 and Nora died on 2 May 1995, both in Orange County, California. They are buried in the same plot in Forest Park Memorial Park Glendale Cemetery in Los Angeles County, California. James Carl Williamson (“Bud”) was born on 29 November 1907 in Springfield, Illinois. He married Rosemary Maxine Laws on 24 February 1934. [Rosemary Laws was born on 8 October 1915 in Vigo County, Indiana to William Z. Laws and Evelyn Figley.] The pair had two children, listed below. Bud died on 7 August 1997 in Orange County, California. He is buried in Fairhaven Memorial Park Cemetery in Orange County, California. George Claybourn Williamson was born on 26 April 1939 and died on 29 July 2011. Carlene Louise Williamson was born on 7 February 1945. She married (1st) Abel B. Flores, then they divorced in June 1976 in Los Angeles, California. She married (2nd) John S. Aguilar on 26 October 1985 in Los Angeles. Mary Ethelyn Williamson was born 16 June 1910 and lived for a time with her Aunt Ethel (her mother’s sister) prior to Ethel’s death in 1919. Mary married Burl Denver Garner on 6 December 1925. [Burrell Garner was born on 21 January 1907 in Kentucky.] They had five children together and divorced in about 1938. Mary died on 3 September 1954 in Los Angeles, California, and is buried there in Forest Park Memorial Park Glendale Cemetery. Patsy Lucille Garner was born on 13 May 1927 and married (1st) on 3 August 1945 to Richard James Quick (“Bill”) (1925-1972). They had three children, listed below. Patsy married (2nd) on 7 August 1973 in Santa Barbara County, California, to Richard Kenneth Danskin (1926-2007). Michael James Quick was born on 16 March 1946. Kerianne Michelle Quick was born on 11 October 1977. Robin Marie Quick was born on 31 August 1979. She had one son, Nathanael, born on 9 November 2001. Kimberly Quick (adopted) was born on 20 December 1980. She had a son named Matthew born in October 2001. Jessica Lynn Quick was born on 9 October 1986. Steven Quick was born on 8 September 1948 in Los Angeles County, California, and died there on 27 March 1976. He is buried with his father in Forest Lawn Memorial Park Hollywood Hills in Los Angeles. Ramona Quick was born on 27 September 1969. Deborah Corrina Quick was born on 21 May 1971. She had a child, Shaw-nee, born on 8 August 1993. Jacqueline Flower Quick was born on 3 February 1973. She had a son, Steven Noah, born on 9 November 2000. Richard William Quick (“Billy”) was born on 2 August 1953. Richard William Quick was born on 14 February 1976. He had two chil-dren, Carrissa Renee Quick (born on 18 February 2001) and Marcus Jacob Quick (born on 7 September 2005). James Wesley Quick was born on 14 February 1978. Robert Steven Quick was born on 28 February 1982. Barbara Rose Garner was born 22 April 1929 in Los Angeles, California. She married (1st) Donald Leon Jewett on 23 August 1945, and later divorced. They had two children, listed below. Barbara married (2nd) in about 1957 to Mr. Howard and married (3rd) in about 1966 to Mr. Campo. Barbara died on 2 November 1996 in Ventura County, California. 1. Michelle Lynn Jewett was born on 29 May 1946. She married Gary Frederick Smith on 10 May 1968 and they later divorced. Deanna Michele Smith was born on 2 May 1966 in Glendale, California. On 20 February 1999, she married Allan Robert Smith (born on 14 October 1960 in St. Louis Park, Minnesota) in Simi Valley, California. They had three children: (i) Dylan Alexander DeLomprey was born on 14 August 1994 in Woodland Hills, California; (ii) Drew Everett DeLomprey was born on 21 September 1994 in Simi Valley, California; and (iii) Abbie Rose Smith was born on 19 September 2002 in Woodland Hills, California. Justin Christopher Smith was born on 14 March 1977 and died in June 1994. Donald Thomas Jewett was born on 20 November 1950. Martin Burl Garner was born 13 November 1933. Louise Beatrice Garner (“Deedie”) was born on 21 May 1936 in Los Angeles, California. On 10 April 1959 in Alameda County, California, she married to Samuel Joseph McVeigh (born on 20 September 1937 in Allegheny County, Pennsylvania, and died on 3 December 2001 in Burbank, California). Deedie may have previously been married to Mr. Serrano. Louise and Samuel had a daughter, Denise, listed below. They divorced on 29 December 1978 in San Diego County, California. Deedie married last on 12 July 1981 in San Diego County to Richard Kent Rozelle. Deedie died on 16 December 1988 in Escondido, San Diego County, California, and is buried there in Oak Hill Memorial Park Cemetery. Denise M. McVeigh was born in 1960 in Los Angeles County, California. Denise is pictured in a 1974 junior high school yearbook from Escondido in San Diego County, California. She married Daniel J. Polancic there on 29 August 1981. They had a daughter Rachael Ann Polancic in 1986, a son Andrew Michael Polancic in 1989, and a son Jesse Daniel Polancic in 1993. Harold Earl Garner was born on 3 March 1950 in Los Angeles, California. He married on 6 October 1980 in Los Angeles County, California, to Helen Catherine Lynch. Juanita Bess Williamson (“Nita”) was born on 30 December 1911. She only finished eighth grade, but never lost an interest in learning. In a book on centenarians published when she was 102 years old, Juanita recalled, “I was always a reader and loved the library. I like bird books and bird watching, flower books to help with my garden, which I still maintain, and tour guides to read about places I’d like to see.”[Franklin, Steve and Lynn Peters Adler. Celebrate 100: Centenarian Secrets to Success in Business and Life (John Wiley & Sons, 2013). ]She met her first husband, Pasqual Gregory Cioffi, at an open-air dance hall when Juanita was just 16 years old. [Pasqual Cioffi was born on 15 January 1904. Although he was apparently born in New York (or New Jersey), he is on a passenger list arriving from Italy on 4 May 1910 when he was just nine years old, according to New York passenger lists, most likely because both of his parents (Clemente and Maria Cioffi) were from there. Pasqual died on 18 Mar 1950 in Los Angeles.] They married that same year on 28 September 1928. Their first son, Jack, was born when Juanita was just 17. They had two more children, Anthony and Carla, and then divorced. Juanita married (2nd) George Redpath Jr. (1919-2001) right after World War II in 1946. They had one son, George, listed below. Jack Gregory Cioffi was born 17 June 1929 served in the Marines. He married (1st) on 11 April 1959 to Charlotte Lucille Heranval (1930-1988), who was previously married to Jack Neil Marlow (1924-2000) with one son, listed below, and they later divorced. They had one son. He married (2nd) to Barbara Joan Wiggs on 14 August 1965 in Clark County, Nevada, and they divorced shortly afterwards in December 1966 in Los Angeles County. Anthony married (3rd) to Charlene Diana Secours on 5 January 1973 in Orange County, California. Anthony M. Cioffi was born on 11 April 1959 in Los Angeles County, California. Anthony James Cioffi was born on 10 March 1937 in California. He was an Army veteran from service in the Vietnam War. He married (1st) on 3 February 1963 to Irene Neila Dematteis (1941-2005). They had two children before divorcing. Anthony married (2nd) on 22 April 1972 in Riverside County, California, to Janet D. Schrader. Anthony died on 17 October 1996 in Reno, Nevada, and is buried at San Joaquin Valley National Cemetery. Carl G. Cioffi was born in 1963 in Orange County, California. Angelique M. Cioffi was born in 1965 in Orange County, California. Carla Cioffi was born in 1942 in Los Angeles County, California. She married on 29 July 1961 in Los Angeles County to David R. Crane. George Stanley Redpath was born on 10 January 1947 in Los Angeles County, California. On 29 July 1967 he married Nancy Lynn Catledge. They had two sons and later divorced. Jonathan C. Redpath was born in 1972 in Sacramento County, California. Eric B. Redpath was born in 1976 in Sacramento County, California. Thelma Lois Williamson (recorded Nadena Beatrice) was born 5 April 1914 and married (1st) to Glenn Eugene Gettle (1912-1966), who married several times, served in the U.S. Navy during World War II. Their marriage was annulled and Glenn is buried in Fort Rosecrans National Cemetery in San Diego, California. She married (2nd) to Nicholas Angelo Lomando (1924-1977), who married several times and served in the U.S. Navy during WWII. Nicholas had a daughter by a previous marriage, Angela Marie Lomando, who was born 20 July 1948 and died on 26 November 1999. Thelma died on 9 June 1980. William Claybourn Williamson (“Buddy”) was born on 25 May 1919. He married Ann Bradford Ward on 22 July 1943. He and Ann had two children, Jeffrey and Ann, listed below, and later divorced. Buddy married (2nd) to Mary Adell Potts in 1957 and they had one child, Carla, listed below. Buddy died on 26 January 2001 in Homeland, California. Mary followed on 10 March 2002. Jeffrey Scott Williamson (“Jeff”) was born on 11 February 1945 in Alhambra, California. Upon graduating from Covina High School, Jeff immediately joined the United States Army and received two Bronze Stars while serving two tours of Vietnam as a proud member of the 173rd Airborne Division. While stationed at Fort Riley Kansas, Jeff met and married the love of his life, Theresa “Tracy” Ann Dusky on 12 March 1970. During the next 41 years, they remained inseparable as they raised five children and numerous foster children, including three that Tracy took with her into the marriage – Deborah, Donald, and Dennis, all listed below. Jeff and Theresa had one child together, Corrine, listed below. They then adopted a son, Donavan, listed below. Deborah Sue Williamson was born on 5 April 1964 to Tracy in her first marriage, and was later adopted by Jeff and took his last name. She married Darin Floyd Fuller on 23 March 2003 in Klamath County, Oregon. Donald James Williamson was born on 16 October 1965 to Tracy in her first marriage, and was later adopted by Jeff and took his last name. He married Crystal Ann Hickmon on 6 October 1984 in Washoe County, Nevada. Dennis Michael Williamson was born on 3 December 1968 to Tracy in her first marriage, and was later adopted by Jeff and took his last name. He married a woman named Sheila. Corrine Darlene Williamson was born on 11 March 1971 to Jeff and Tracy Williamson. She married Gary Francis Gallagher on 17 April 1993 in Klamath County, Oregon. Donavan Scott Williamson was born on 1 September 1997 and was adopted by Jeff and Tracy Williamson. He died in April 2013 in Klamath Falls, Oregon. Leslie Ann Bradford Renckens was born on 15 June 1979. She married on 31 August 2002 to Luke Zebulon Mathis (“Zeb”). [Luke Mathis was born on 18 November 1979.] Leslie and Zeb had one child, Kate. Kate Abagail Mathis was born on 6 November 2006. Carla S. Williamson was born on 23 February 1958 in Los Angeles County, California. She married on 16 June 1976 in Los Angeles, California, to William C. Robertson (born in about 1957). She may have later married Rodger Lee Carney on 30 October 1992 in Clark County, Nevada.